Africa RISING intervention areas in the Ethiopian Highlands( Image credit:ILRI). 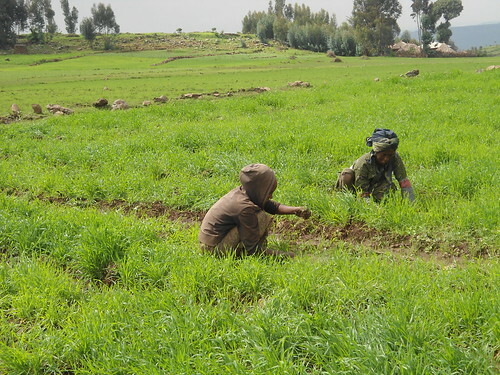 In Ethiopia, the Africa RISING program is being implemented in eight kebeles (the lowest administrative units in Ethiopia, Goshe Bado, Gudo Beret, Salka, Ilu-Sanbitu, Jawe, Upper Gana, Emba Hasti and Tsibet) in four districts of Amhara, Oromia, SNNP and Tigray regions. The eight kebeles were selected on the basis of specific criteria including previous experiences of the partners, areas presenting opportunities for sustainable intensification, and sites undertaking crop, livestock, tree and NRM activities. 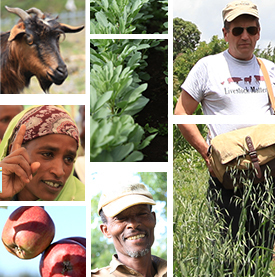 The main aim of the Ethiopian Highlands project is to identify and validate solutions to the problems experienced by small­holder crop-livestock farmers in the Highlands. Some of these problems arise from the difficulties that farmers face in managing the resources that they have and in capitalising on the efficiencies that managing crops and livestock together can introduce into a farming system. However, realising this potential is often influenced by other factors such as cost effective access to inputs and the reliability of markets for saleable produce. To address these issues, Africa RISING takes an integrated approach to strengthen the farming systems of the Ethiopian highlands. It conducts participatory research that identifies technologies and man­agement practices that work for farmers whilst accounting for the wider contexts in which these must operate. These contexts include the nature and effectiveness of markets for inputs and outputs, of community and other institutions and of the policy environments that influence farm households. To implement the Africa RISING rolling work plan that was developed in 2013, a set of research protocols targeting the main problems and opportunities identified are being implemented. These protocols are issue-based and are implemented across the sites by mixed teams of CGIAR institutes, local partner organizations, and innovation platforms comprising communities and farmers. Download the list of research protocols. At woreda (district) level, strategic IPs support kebele platforms and farmer research groups. They bring together stakeholders to support wider adoption of innovations. At kebele level, operational platforms oversee local research activities, foster integration among the farmer research groups, and promote alignment of local on-farm research with district priorities. Farmer research groups are like innovation clusters. They involve all farmers who are active around specific clusters of research activities – such as forage production, water delivery or varietal improvement. The roles of these groups are expected to expand to promote scaling of innovation to wider groups of farmers. An important aspect of the project is that ‘scalable innovations’ identified and validated through action research will reach many other communities. Download the scaling plan.